The world of work is undergoing fundamental transformations. We see technological developments such as digitization and automation in an ever-increasing number of sectors and intensity. Companies and public sector organisations have to reshape their value creation processes and guide their employees to new job roles, creating an uncertain outlook. Are your team members embracing and shaping change, or are they being driven by it? The ability to utilize modern technologies and methods is just the surface. Overcoming resistance to change, stressful conflicts, and lack of openness are major road blocks. We also need to look at a deeper level of learning. Employees need to rethink their job roles, the relationship to others, and what good work means to them. Leaders need to take new approaches to match the new responsibilities. This indicates the importance of the professional identity of individuals and occupational groups. Employees are often not given spaces to engage in conversations and transform their identity, to consider the emotional aspects of their work, or to acquire the skills for moving from a problem focus to a solution focus and help each other in their learning process. In this short book, we look at the role of technology for learning in the workplace to support identity transformation. Abstract Mitarbeiter von Arbeitsagenturen sehen sich derzeit großen Verände-rungen gegenüber, die ihr berufliches Selbstverständnis herausfordern. Im Rahmen des Projektes EmployID wird untersucht, wie sich mit Hilfe von „Social Learning“-Ansätzen die Weiterentwicklung des beruflichen Selbstver-ständnisses fördern lässt. Anhand von drei Kontexten (Vereinigtes Königreich, Kroatien, Slowenien) und vier technisch-konzeptionellen Ansätzen (Reflexion, Social Learning Programmes, Visualisierung von Arbeitsmarktdaten und Peer Coaching) wird gezeigt, wie sich konstruktive Veränderungsprozesse anstoßen lassen, die das „Lernen von anderen“ in den Vordergrund stellen. Facilitation of Mutual Learning through Technology-Enhanced Peer Coaching. Abstract Angesichts des demographischen Wandels und der disruptiven Veränderung von vielen Industriebereichen durch die fortschreitende Digitalisierung/Industrie 4.0 sieht sich das Thema Kompetenzmanagement vor neuen Herausforderungen. Es geht nun vor allem um agile Herangehensweisen, die Umbruchssituationen und kreativen, auf Einzelsituationen angepassten Einzellösungen gewachsen sind. Der Beitrag stellt ein Kompetenzmanagementprozessmodell und dessen Anwendung auf konkrete Unternehmensbeispiele vor, das auf die wechselseitige Abhängigkeit von unterschiedlichen Ebenen (operativ, strategisch, normativ) und die Verknüpfung mit anderen Unternehmensprozessen abzielt. Dabei ist im besonderen Fokus der Einbau von Lernzyklen für ein Double-Loop-Learning, um die Zielsetzung und eingesetzte Methoden an die sich teilweise schnell verändernden Umgebungsbedingungen zu erreichen und doch auf ein stabiles systematisches Vorgehen setzen zu können. Abstract Design-based research has become increasingly popular in collaborative cross-disciplinary research projects. Based on the experience in several European research projects, this research methodology allows for more agile research approaches. However, it is still a challenge to turn design experiences into a sound body of evidence that can be transferred to future design problems. In this paper, we want to describe an approach to collaborative research projects that extends design-based research with the use of design patterns. We particularly focus on how emergent knowledge can be captured as proto-patterns, how the knowledge develops along the research process, and how such projects can be geared towards pattern outcomes. Towards that end, we present a pattern maturing process describing phases of pattern development that is based on knowledge maturing phase model. 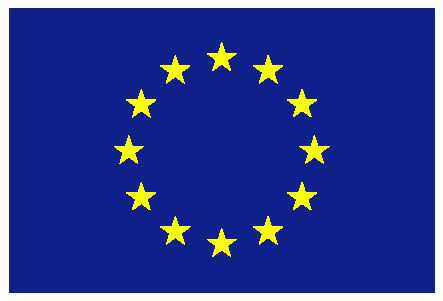 Abstract The paper is based on early research and practices in developing workplace Learning Analytics for the EU funded EmployID project, focused on identity transformation and continuing professional development in Public Employment Services (PES) in Europe. Workplace learning is mostly informal with little agreement of proxies for learning, driven by demands of work tasks or intrinsic interests of the learner, by self-directed exploration and social exchange that is tightly connected to processes and the places of work. Rather than focusing on formal learning, LA in PES needs to be based on individual and collective social practices and informal learning and facilitation processes rather than formal education. Furthermore, there are considerable concerns and restraints over the use of data in PES including data privacy and issues including power relations and hierarchies. Following a consultation process about what innovations PES would like to pilot and what best meets their needs, PES defined priorities for competence advancement around the ‘resourceful learner’, self-reflection and self-efficacy as core competences for their professional identity transformation. The paper describes an approach based on Social Learning Analytics linked to the activities of the EmployID project in developing social learning including advanced coaching, reflection, networking and learning support services. SLA focuses on how learners build knowledge together in their cultural and social settings. In the context of online social learning, it takes into account both formal and informal educational environments, including networks and communities. The final section of the paper reports on work in progress to build a series of tools to embed SLA within communities and practices in PES organisations. Europaweit vernetztes Problemlösen in den öffentlichen Arbeitsverwaltungen mit Kollegialem Coaching Tool. Abstract Pattern-based approaches are becoming increasingly popular to capture design experiences for a wider audience. This rises to particular importance in participatory processes, such as user-driven design approaches. However, the creation process of such patterns is challenging, especially when it comes to motivational, affective and other soft factors. In this paper, we view the pattern development as a knowledge maturing process, i.e., a process of collective knowledge development. We describe the pattern development process, identify barriers in this process, and explain how various social learning approaches, such as peer coaching, social learning programmes (i.e., online courses with a collaborative focus), and reflective instruments in agile processes contribute to the key issue of decontextualizing and recontextualizing experiences in a continuous way. Coflection - Combining Mutual Support and Facilitation in Technology Enhanced Learning. The Trouble with Systemic Solution-oriented Self-E-Coaching. Emotions as Key Factors in Changing Patterns. User and Group Behavior in Computer Support for Collaborative Reflection in Practice: An Explorative Data Analysis. Abstract Software engineering has been transformed in recent years by understanding the interaction with customers and the target context as an ongoing learning process. Responsiveness to change and user-centered design have been the consequences. In a similar way, knowledge and ontology engineering are undergoing fundamental changes to acknowledge the fact that they are part of a collective knowledge maturing process. We explore three examples: social media based competence management in career guidance, ontology-centered reflection in multi-professional environments in palliative care, and aligning individual mindlines in pratice networks of General Practitioners. Based on these, we extract five types of designing for knowledge maturing and associated technical implementations. This shows that future technology support should especially target facilitation of self-organized, but tool-mediated knowledge development processes, where, e.g., workplace learning analytics can play a prominent role. Abstract Public Employment Services (PES) in Europe are authorities that attempt to match supply and demand on the labor market. Rising unemployment in times of crisis and demographic change are among the main challenges with which PES practitioners, as a direct interface between jobseekers and employers, have to deal. They have to support career adaptability of their clients, as well as to enhance and transform their own individual and collective professional identities, in order to cope successfully with the challenges of a changing labor market. As part of the research project EmployID, we are exploring how to facilitate the learning process of PES practitioners in their professional identity development. The aim of the project is to empower individual PES practitioners, their community, and organizations, to engage in transformative practices, using a holistic tool suite combining e-coaching, reflection, MOOCs, networking, analytical, and learning support tools. The key to successful professional identity transformation is continuous learning. Individuals may take on the role of facilitators for the learning of others as well as being facilitated by peers, technology and environment. 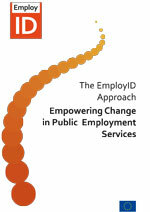 Abstract Public Employment Services (PES) in Europe are authorities that match supply and demand on the labor market. Rising unemployment in times of crisis and demographic change are amongst others main challenges that PES practitioners, as direct interface between jobseekers and employers, have to deal with. They have to support career adaptability of their clients as well as to enhance and transform their own individual and collective professional identity to successfully cope with today’s challenges of the labor market. 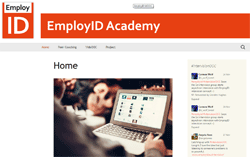 The research project EmployID is exploring how to facilitate the learning process of PES practitioners in their professional identity development. The aim of the project is to empower individual PES practitioners, their community and organizations, to engage in transformative practices, using a holistic tool suite combining e-coaching, reflection, MOOCs, networking, analytical and learning support tools. Initial contextual exploration has started to reveal the complexity of challenges when introducing learning innovation in these public organizations.